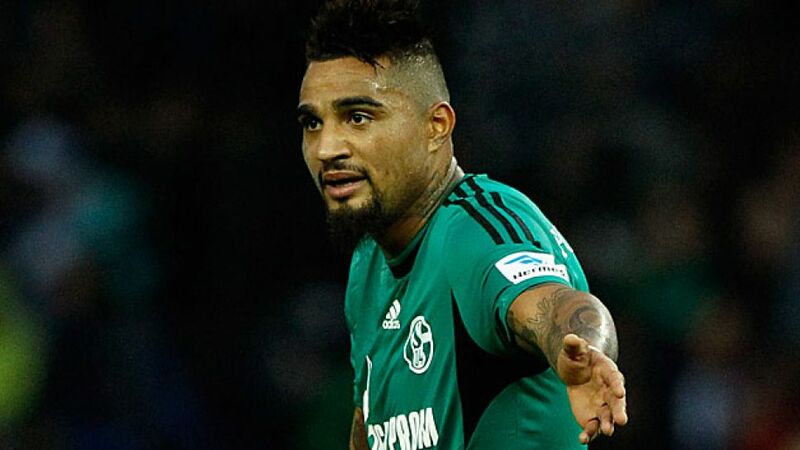 Kevin-Prince Boateng (r.) said his side's 2-0 win over Hertha Berlin was "a great battle"
Berlin - FC Schalke 04's Kevin-Prince Boateng said his side won a "great battle" in the 2-0 win over Hertha Berlin at the Olympiastadion, while the hosts' Tolga Cigerci lamented another goal conceded from a set piece after they were on Matchday 11. Kevin-Prince Boateng: This was a great battle. I always feel I've got room for improvement, but I'm pleased that we've won and also that I played the full 90 minutes. Benedikt Höwedes: After about 20 minutes, we got a foothold in the game, started creating chances, and Adam took one of them. Taking the lead was good for us because it meant Hertha had to attack more. We were solid at the back and waited for a counter-attack, which we got right at the end. Timo Hildebrand: We’ve rewarded ourselves for our efforts. It was a great performance from us. We lost to two strong teams in Chelsea FC and Borussia Dortmund so this win in Berlin really does us good. We were convincing. Johannes van den Bergh: It’s really frustrating that we’ve lost this game. We played well, put them under a lot of pressure and had plenty of chances, but we didn’t take them. Set-pieces are part of the game and we’ve got to be able to defend them, but we didn’t. It’s disappointing. Tolga Cigerci: We conceded from a set-piece again, which we’ve got to defend better, but looking at the game as a whole, we played well. Our fans were great. Hopefully we can win [next week] in Hoffenheim because if we play this well, then we should be winning. Overall, apart from the fact we didn’t get any points, we played really well. Fabian Lustenberger: I think we can be pleased with the performance, but results, not performances, are what matter in football. Maybe we weren’t quite at our maximum. Once again, a set-piece was decisive.